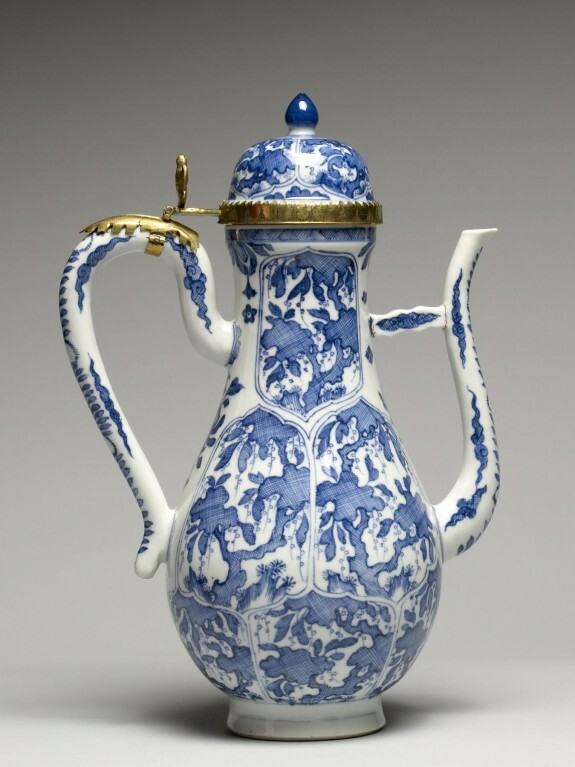 Description This wine ewer with pear-shaped body, high handle, upright curving spout, and bell-shaped cover with a knob is painted with underglaze decorations in deep cobalt blue. Six foliated panels on both sides are filled with trees, rockery, and vines colored with thin crosshatched strokes. The handle and spout are painted with vines, blossoms and clouds scrolls. A metal gilt mounting acts as a hatch for the lid and attaches to the handle. A small bird is perched on the hinge of this mount. These gilt additions are European (either Dutch or German), an indication this ewer was an export from China to a European market. Provenance William T. or Henry Walters Collection, Baltimore, prior to 1897 [mode of acquisition unknown]; by bequest to Walters Art Museum, 1931.